Amsterdam is a world renowned party hotspot, what with its exciting nightlife and liberal attitude. You can be sure of a great time during any weekend of the year, but New Year’s Eve is sure to be something even better. With many people travelling to Amsterdam to see the New Year in, you are pretty much guaranteed big crowds, full nightclubs and a party atmosphere pretty much anywhere you go. 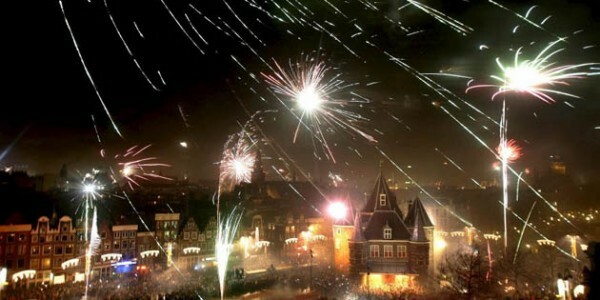 Here is our list of things to see and do during your New Year’s Eve in the Dutch capital. The official celebrations will be held in the Oosterdok area, with the VOC Ship The Amsterdam and the Scheepvaartmuseum as the backdrop for the event. The evening culminates with a sing-along and fireworks over the River IJ. Entrance is free and this is a great way to see the New Year in with your family. Glamorous house music lovers should check out Hed Kandi’s New Year’s Eve Special onboard the Ocean Diva. Partygoers will be treated to glitter canons, champagne showers and an excellent fireworks display. If you’re looking for something a little different and weird, then you should consider attending the Freaqshow at Ziggo Dome. This evening will promise some crazy entertainment, strange live shows and hard style music for those of you that are true ravers. Fans of techno music should head down to Awakening’s New Year’s Eve Special at Westergasfabriek. You can expect excellent music from the line-up of international DJs and even an indoor fireworks display. For those people into hip hop, TIKTAK NYE at the Heineken Music Hall will be playing a range of music including hip hop, electro, trap and more. TIKTAK’s events always prove to be crowd pleasers. New Year’s Eve in Amsterdam is sure to be busy, so consider booking your accommodation early. You can book hotels in Amsterdam online now at the Accorhotels’ website.